Jean Mcglynn trained in London at the Mountview Academy, winning the prestigious Singing Scholarship on 3 occasions. 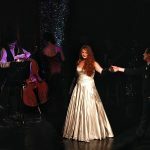 Throughout her singing career, Jean has worked with Sir Andrew Lloyd Webber, Sir Ben Elton, Ian McShcane, Jon Lee, Sir Cameron Mackintosh and appeared onstage alongside Dame Judi Dench. She has starred in many musicals, both in Ireland and in London’s West End, including the world renowned Les Miserables and Oliver! Her album recordings include The Witches of Eastwick, South Pacific Revival and I Got Rhythm. Recently, she was guest performer for Children in Need (BBC1) and is featured artist in N.F.U. television commercials.